Back cover: "Raised in a secular family but increasingly interested in the relevance of Faith in our modern world, A.J. Jacobs decides to dive in headfirst and attempt to obey the bible literaly as possible for one full year. He vows to follow the Ten Commandments. To be fruitful and multiply. To love his neighbor. But also to obey the hundreds of less publicized rules: to avoid wearing clothes made of mixed fibers; to play a ten string harp; to stone adulterers. The resulting spiritual journey is at once funny and profound, reverent and irrevernet, personal and universal, and will make you see history's most influential book with new eyes. The Year of Living Biblically will charm readers both secular and religious. It is part CliffsNotes to the Bible, part memoir, and part look into worlds unimaginable. Thous shalt not be able to put it down." 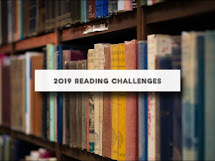 "The Year of Living Biblically" is one of the books I chose to read for the Dewey's Books Reading Challenge and also the last book, so this completes the challenge. A.J. Jacobs is a writer for Esquire magazine and Jewish. He is also agnostic. When he decided to take on this project, he read as many bibles as possible, talked to as many religious advisers and followed the old testament for the first 8 months, then the new testament for the remaining 4 months. Following the Hebrew bible, he wrote down the 100's of rules and tried to follow them literally. He journeyed to Kentucky to visit the Creation Museum founded by Answers in Genesis - believers in a young earth and that dinosaurs roamed the earth at the time of Noah. He actually called up and invited a Jehovah's witness to come to his home to discuss their beliefs. He stuffed small pebbles in his pocket and went to central park to try and find an adulter who would allow him to throw pebbles at him and cross off his list that he stoned an adulter. He found that when he tried to follow the law of not touching a woman during that time of month, he found the woman in his office more than willing to share the dates with him. Jacob's story of his year trying to literally follow the rules is humorous, enlightening, and entertaining. It is not offensive in any way shape or form. Highly recommended. 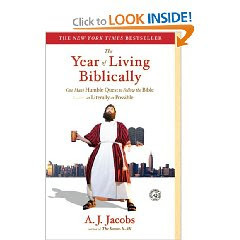 “The Year of Living Biblically” is fun and spiritual, with irreverant reverance and reverant irreverance. I think this could be enjoyed by all, religious or not." "It's an ambitious project, as Jacobs soon finds out; he's attempting to do in one year what most people don't accomplish in a lifetime. But he's game, almost naively so, to give it a try. And the result is a funny, fascinating, enlightening book." "Jacobs does a good job of balancing his incredulousness at some of the rules and, rather than just dismissing them outright, trying to find an explanation for why the passage was written or interpreted as we now know it. In that sense, I think Jacobs does a good job of taking his quest seriously and writing in a way that points out the inconsistencies in literal interpretation of the Bible without mocking those who practice religion in that way. It’s a hard line to walk, and I admire how well Jacobs manages to balance." That sounds like an entertaining read. I wonder if it altered the way he lived his life permanently. Thanks excellent review and for the recommendation.